Telling the audience they’re going to play a networking game at a large corporate event will accelerate plenty of attendee heart rates. But since an event can’t be considered a success unless it brings people together – it’s time to find the event icebreakers that make networking possible for everyone. Icebreakers help cultivate a shared experience for your event and turn attendees into engaged participants. Coming up with innovative games or fun networking ideas can be tough, though. 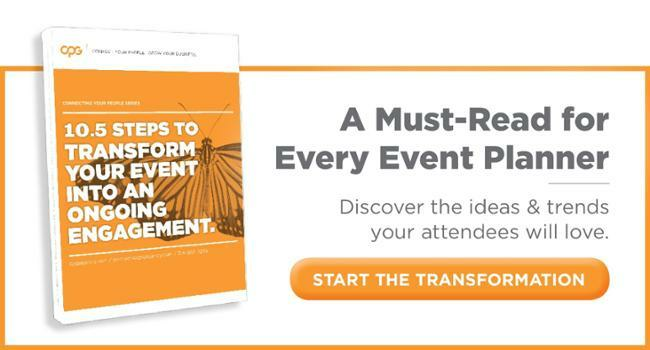 Stick to these best practices by incorporating elements before, during and even after your big event. Done right, you’ll create a sense of shared community within your brand. More than just a place card for social trends at events, hashtags serve an important purpose at large corporate events. A unified hashtag helps organize online discussions and connect people well before the event has started and will serve as a digital hammer to break through that sheet of ice heading into a conference. Generate pre-event buzz with a clever or specific hashtag that your people will feel comfortable using. Your corporate event planners can utilize the hashtag to present pre-event FAQs, provide a sneak peek at speakers and spark discussion amongst participants. Mobile event apps are another innovative tech trend that connects prospects or colleagues by allowing attendees to create profiles and engage with peers before the event – plus, they serve as wonderful organizers for event planners to engage the audience through contests, quizzes and forums. Users love the gamification of event apps which lets them play well before the meeting and compete for a prize or recognition at the actual event. Large audience sizes may cause meet-and-greets to feel awkward and forced. Working within the audience size helps ease tension. For example, breaking the audience into smaller groups helps create a more intimate and worthwhile experience without anyone feeling particularly overwhelmed. As the name suggests, one person lists three “facts” about themselves, except one of them is a dream. The best way to play is to have a discussion about each “fact” to better get to know the person. The game paves the way to great discussions of other’s accomplishments, life experiences and aspirations. Perhaps a revelation within the group will create an important connection down the road. Provide pennies no more than 15 years old to the group. Each member introduces themselves and is required to think of a significant event that occurred in the year printed on the penny. This provides great insight about how someone traversed along their career path and opens the table up for an interesting discussion. This is a great icebreaker game to get people moving. Attendees have a list of certain criteria like finding a particular person from a particular department. Frankly, it’s just a more interesting way to interview people. Even though not everyone will be the correct match for your scavenger hunt, it’s a fun approach to meeting a wide range of people from your company. When participants have filled out their name tag and settled into their smaller group, have them interview someone they don’t know. Sounds easy at first, but, after the interview, participants switch name tags. The interview process restarts and the participants must try to remember the facts about the last person they interviewed. Everyone likes free stuff and they’re usually willing to work for it. The object of this getting-to-know-you game challenges participants to interview as many people as possible and collect their business cards. If your event has a bar, the lucky winner receives a free ticket. If not, offer up a sweet swag bag. It’s a short term reward, but the pile of business cards collected offer up the possibility of long-term professional connections. Want to break out of the ordinary with your corporate breakout sessions? Polling platforms serve as an efficient way to break the ice amongst participants and keynote speakers. Engaging and conversing with attendees helps connect any possible shared goals over all facets of a company and gain insight into attendees. Traditional networking only goes so far when everyone has a phone in their pocket and they’re more than likely going to be on it at some point during the event. Blending traditional and digital networking can become a magical thing through innovative methods. This is where your social hashtags and event apps can play a large role during the conference. Gamify social tagging using fun activities like the Twitter Balloon. When your event participants share thoughts and updates during the event, it can spark an opportunity for either private messages within the app or in-person meet ups. Some apps feature a beacon to identify who is at a particular breakout session. Through their profile, users can see who is in the room and open the possibility for an in-person conversation. Looking for more icebreakers? Check out this complete list of networking games! Networking at times feels like flirting. Often times, awkward approaches occur, interrogative questions are asked, a moment of calculating whether the relationship will go anywhere is held and phone numbers are swapped. However, leaders of a corporate event should facilitate the networking process through to the end. It’s an investment of time and money, but the corporate event ROI will sustain the passion created at the conference. Event apps once more serve as powerful tools to connect people after the event ends. Messaging boards and post-event surveys will help corporate event planners gain insight into whether their efforts met expectations as well as help attendees gain insight into their professional goals. Asking appropriate questions about participants’ favorite breakout sessions, biggest event takeaways or post-event career goals may help connect others who may not have had the chance to meet during the event. It’s a forum where ideas are shared, connections are made and teamwork thrives. When done right, your corporate event will transform attendees into participants and employees into brand ambassadors. And when you connect your people, it’s that much easier to reach important brand goals. As a full-service, creative engagement agency specializing in live experiences and event production, CPG Agency can provide the engaging tactics to connect your people before, during and long after your next corporate conference or meeting.